Daniel Coyle opens his book by discussing an experiment. Several different groups, including lawyers, doctors, CEOs, and kindergarteners were tasked with building the tallest structure possible using marshmallows, dried spaghetti, and other sundry materials. Common sense would say the kindergarteners performed the worst. As it turns out, the kindergarteners performed the best, and by a large margin. Coyle gives numerous other examples of seemingly inferior groups outperforming their counterparts. Why is this? Coyle tries to show throughout his book that competency and resources are not the most important conditions for success. 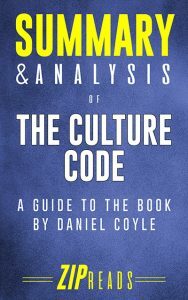 Rather, Coyle devotes a third of his book to each of what he identifies as the three keys to success: a sense of safety, shared vulnerability, and shared purpose. He supports each idea with real-life examples, using one or two to support a specific component of each trait. Through these examples, Coyle demonstrates that success is truly accessible, that it is something that can be cultivated, and not merely something that is happened upon by the powerful and skilled.